For day 1, I was considering Klingon T'Ong drop (Mirror based with the Regency 1) and the TNG Feds. In the end, TNG Fed seemed to be more robust and less dependent on luck drawing into certain cards, so I chose them. TNG Fed are still among the fastest solvers and I decided to combine them with Handshakes and Androids. I prefer the Androids as a 3rd free play over Earth or Metaphasic Shield Testing, since it doesn't depend on a certain location. Also, I wanted to go for a 2 mission win and chose The Nexus + Tolian Soran, which I think is even better than The Genesis Device (which Fed cannot use anyway), since it has great potential for ship destruction and can be scored immediately if combined with Mysterious Orb. I usually self-seeded Nexus at Assist Damaged Vessel and worked through the dilemmas with help of Science Lab on the Nor. This worked very well in all games, except in the final against Arjan, who wiped out half my deck thanks to a good damage dilemma combo and ship battle (well played, mate! ), before I could finally solve it. Did you consider changing decks for day two, or was it always the plan to stick to the same deck and make small adjustments? First of all, I played basically the same deck on day 1 and day 2. I only added a Docking Pylons on day 2 because I wanted to be able to dock the Enterprise-D. For day 2, I originally brought my Vandros IV regionals deck (Earth camping with Recruit Mercenaries and lots of Surprise Amity). It is a great day 2 deck, since the Surprise Amities slow the opponent down a lot. However, I decided against it because some players in the top 8 already knew it and the deck is pretty much dead if someone seeds heavily under Earth or brings interrupt prevention. 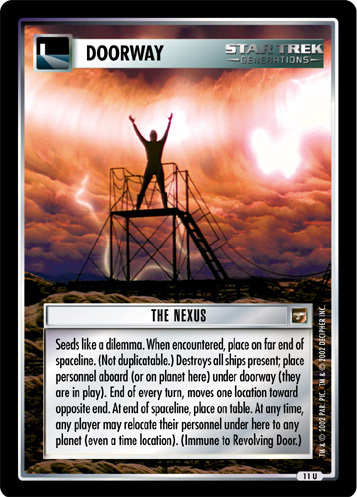 In the TNG deck, Earth is only a decoy mission (Attracting dead ends and other nasty things) and an emergency hide-out against battle, so it seemed safer to just stay with the Day 1 deck. But it was a tough choice and it was literally decided minutes before day 2 started. I was a bit afraid of high interference decks locking out missions (e.g. with Post Garrison or Transport Inhibitor), since I was depending on being able to solve the mission with my 2 self-seeds. Other than that, I was just hoping for other solvers to outspeed. I've played similar decks several times, so didn't really learn many new things. In the draw deck, there was not really any space for situational cards. For the first time, I used Mysterious Orb. This guarantees that I get the 20 points for Tolian Soran on the same turn the Nexus is revealed, if I need to. As an alternative, it is a great card against Borg (e.g. relocate their Queen/Counterpart) and other decks that strongly depend on a single personnel. I also added a seeded Mission Debriefing, which saved me in the final against Arjan. The Nexus. In 7 games, it destroyed about 10 opponents' ships and forced the other ships to fly around it, which cost time. I should also mention Dr. Tolian Soran, since his 20 bonus points made a 2 mission win possible in almost every match. In retrospect, it was quite risky using the unprotected, stealable mission Cultural Observation. Luckily, nobody stole it, even though, on day 1, all my other opponents also had Federation decks. It might be prudent to include Taking Charge + Post Garrison next time to secure it. I would also like to thank the organizers for one hell of a weekend with lots of fun side events. My favourite was the Aberdeen Anarchy Iron Man (special thanks to Niall), since nothing beats tearing up a Future Enterprise. If you've been following the First Edition Gameplay forums, you might've happened upon a thread wherein it has been noted that TNG decks have not been very dominant lately. 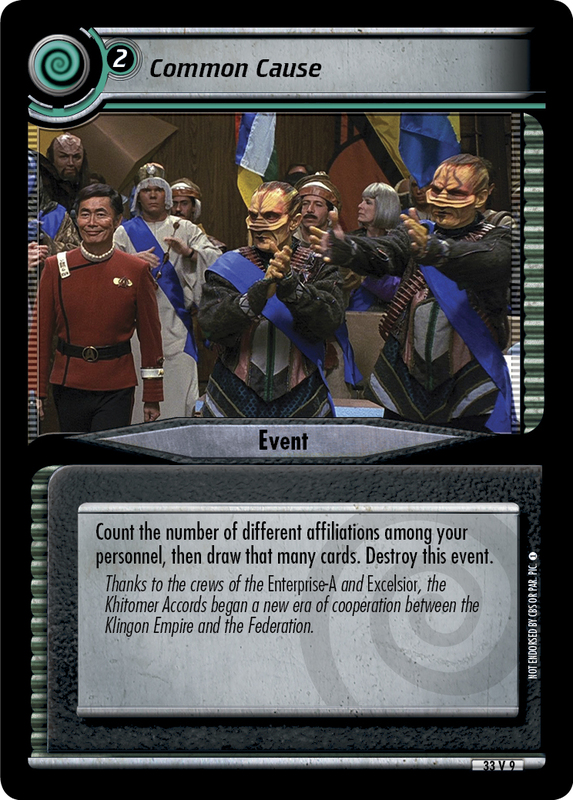 Decks like Edwin's Ferengi seem to have moved away from the more generic TNG builds of the past that just played personnel and threw them at missions, and started playing toward the unique strengths of its affiliation. What, you may ask, is the strength of TNG Federation decks? They don't capture, kill, or discard. They don't slow the opponent down with garrisons or armadas - no, they just solve missions really well. They have the widest variety of mission specialists outside of simply playing generic Alpha Quadrant Federation, and they have access to many easy missions that those specialists can apply their skills to. They are notably the best faction at solving Quantum Incursions, in no small part due to the Holodeck Door play engine supplying not only an on-demand Empathy, but a variety of quality AU-icon personnel who also play for free with Finest Crew. Speaking of the Holodeck Door, I was initially surprised to see the Cafe des Artistes not show up in the seed cards, since I consider it to be one of the better seedable draw engines. TNG Federation decks want to get Sergey and Helena with Assign Support Personnel anyways, since they in turn give access to a rare TNG Fed Treachery (Nikolai), the Cafe just turns them into a draw engine until you need dirty deeds done In the Pale Moonlight. But there it is in the Tent; since Peter's running Holodeck doors anyways, he saves a seed slot by just downloading the Cafe in the play phase. And boy does he use those extra seed slots effectively. Two-mission wins continue to define the competitive landscape this year, and tossing Tolian Soran into the Nexus is a great way to get there. I've often underestimated the ship destruction aspect of the Nexus, but that's because I'm usually playing Hidden Fighter-heavy solvers - against a more aggressive deck, the Nexus can be a huge pain to deal with, and single-ship solvers will struggle too. The real inspired element is the addition of Orb Fragment, which as Peter notes above can be used to get Soran to the Nexus quickly, but I've also never considered the offensive uses he mentions. As a player who is constantly stymied by the Borg, I have to say that being able to inconveniently relocate the Queen is strongly appealing. 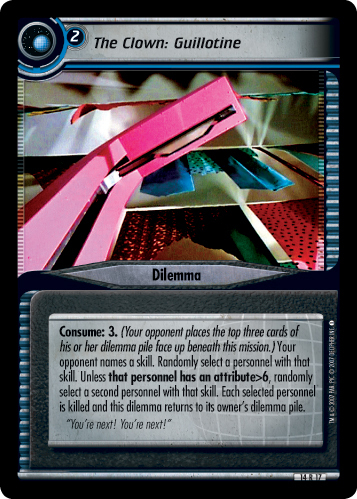 Seeding a Nor just to peek at dilemmas is also very clever - dilemma peeking is powerful enough to have often found itself on the OTF ban list, so even if the peek cannot be moved, it can still be worth the seed slot. I don't often see Mission Debriefing outside of Borg decks (its parallel effect isn't really parallel since the Borg don't "attempt" missions), but when you think about it as spending a seed slot to, at worst, give you one extra turn, it sounds like a good value. I've been seeing more and more single Computer Crash seeds (as opposed to some of the constant crash decks we've seen in the past), and I've experienced it sealing games multiple times. Crashes can greatly improve the effectiveness of your dilemmas by blocking those pesky special downloads of personnel, which, when it is directly competing with space for more dilemmas, is a strong argument for its inclusion. See also: Phil Schrader just recently won GenCon Masters with a version of this deck. Day 1 - Since it wasn't going to matter where people placed as long as they get in, I decided to play something that I could do relatively easily and get into Day 2 with. Unfortunately over time I think I've made the draw deck worse and almost failed in that respect. Day 2 - Couple of reasons: 1) Since it was Swiss I decided to go more speed based than anything else. 2) Based on what I saw the day before, no one seemed ready for the kill pile. 3) Since Ken won with my deck last year I thought it was only fair that I play his deck this year. 4) Speed + Kill = Full Wins. 5) Easy back and forth from Space to HQ is handy to avoid ship interactions which I was counting on experiencing. Anything that is slower than me that couldn't handle the death and carnage, ideally without running TCS. The main deck that I didn't want to see was Maquis because this version of the deck doesn't have Law in it and that would be a problem. I've played similar decks with DS9 before but that was before all the "Common" cards (Common Cause, Enemy, and Purpose) came out which just gave it way more gas for the fire. I've played against Ken playing this deck along with people online a bunch of times, so I knew what it could do. I just paired it with a version of my kill pile. If I were to play it again, I might've considered tweaking the people a bit and adding a Bridge Officer's Test as walls were the biggest stumbling block. Granted, the deck is designed to attempt multiple times but walls and damage dilemmas are the most commonly problematic occurrence for this deck. Otherwise, there wasn't a card in the deck that wasn't used in some fashion during the tournament. While not one particular card but the Common cards were the ones that made the deck what it is - a winner. Most of the time... when the player doesn't do the stupid thing and do two space missions against a 5-space Voyager opponent. Glad that I grabbed the deck off Ken's desk. I've compiled some commentary on this deck by now this season, you can find commentary on Phil's version here, and Ken's version here. There's also commentary on Kevin Jaeger's deck, which was inspired by this one here, and Alexey's version of Kevin's deck here. I find it very interesting: this is clearly a powerful deck given its successes later in the season, but it was also netdecked heavily early in the Regional season without any success. I think that speaks to the value of reading the meta you're walking into; playing this deck in Minnesota, where speed is the name of the game, is going to be more of an uphill climb since people are already prepared for brutally fast decks. However, if you walk into a control-heavy meta, you might just win Worlds. While your opponent is drawing all those situational interrupt denial cards and skill cheaters, you just play all the personnel win the game. A common theme in decks going back and forth between Michael Van Breemen and Kenneth Tufts is the switch back and forth from attrition to kill piles. Michael favors the kill piles, while Ken prefers attrition. As the title of this deck alludes to, Ken won Worlds last year with a deck that Michael originated but there was a key difference: Ken has switched Michael's kill pile to an attrition pile. Since I've covered the draw deck a number of times, I think that this would be a good time to discuss the reasons why one might pick a kill pile or an attrition pile. Kill piles like Michael's work by burying a mission in undercost consume-laden kill dilemmas, leading to a cycle of two attempts per mission (more if there is draw deck support like Uninvited, which this deck lacks). The first attempt buries the mission, then you have to rebuild to attempt again, at which point you usually solve. Kill piles essentially give you a timer before your opponent wins the game, and that timer is largely set by the speed at which your opponent can rebuild. As you can imagine, the decks which are best at rebuilding are speed decks. As an aside, one reason I'm glad to see a resurgence of speed decks like this one is that Kill piles have been very dominant in their absence. Now that you might run into someone playing this deck or Kevin's deck, playing a Kill pile is a riskier proposition. Michael took that risk, banking on the same read that made him pick this draw deck to pair the pile with - and it looks like it worked out for him.